On Feb. 21st, the 8th local Fureai event in Omura took place. The event was created to bring physically and mentally challenged people, local volunteers and elementary school children together to develop an understanding of the world around us. The World Campus — Japan Spring 2008 Class also was invited to participate as guests. After the opening ceremony and an introduction of World Campus International, everyone joined in playing some games. The warm atmosphere made it easy for the WCI participants to communicate and exchange hand-made name cards. The definite highlight was dancing all together to the songs of the Big Country Jazz Orchestra, who also came to play at the event as volunteers. These four precious hours went by very quickly and soon it was time to say goodbye. As Mr. Ashizuka, a staff member at the Kibo-no-Sato (Village of Hopes) facility for people with disabilities said: “If you touch one’s body, you touch one’s heart”. Thanks to his initiative and the help of so many others, 380 hearts were moved with happiness that day. This event was not the only thing which added to our tour’s main theme that week. As Nagasaki is one of the most important places to study the full tragedy of an Atomic bombing, we spent a day at the Nagasaki Peace Center. The center is not only providing historical facts about the A-bombing, but also trying to educate people about recent Atomic tests and the importance of world peace. 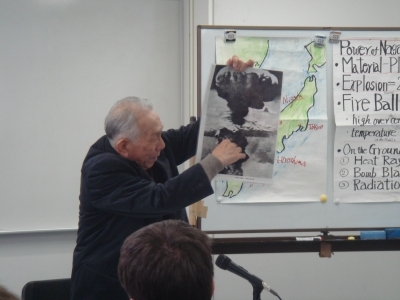 World Campus International also invited Mr. Hirose, a survivor of the Nagasaki A-bomb who recently received a prize for his engagement in Korea-Japan cooperation, to speak to our group. This was a once in a lifetime opportunity for us all to gain first hand historical information. During the following meeting we discussed our varied personal and cultural points of view on this topic. The main focus however was on the involvement both of Japan and America in WW II and we came to the conclusion that history is like a mosaique. We can learn and add pieces one by one to form a big and colorful picture of our past. During both the Fureai Event and the trip to the Nagasaki Peace Center I realized how important it is to become involved in the world surrounding us. Because I am German I have a very sensitive view of WW II, but the trip to Nagasaki opened up a new dimension of this war to me. I have learned that no one can ever win a war, and that everyone was suffering from the irreparable destruction of the bodies and souls of so many people. Yet, no one can ever change what has happened and it is our duty and responsibility to make sure that Nagasaki is the last city ever to be destroyed by an atomic bomb. The Fureai Event on the other hand changed me in quite a different way. Before the event I was really nervous because I had never interacted with physically and mentally challenged people before. Early in the event, when a girl came up to me, touched my hand, and smiled, all of my worries were gone. Communication is not a matter of language or spoken words, it starts within us – it does not know any boundaries. World peace is based on this theory of communication and will be always a possibility as long as we try.